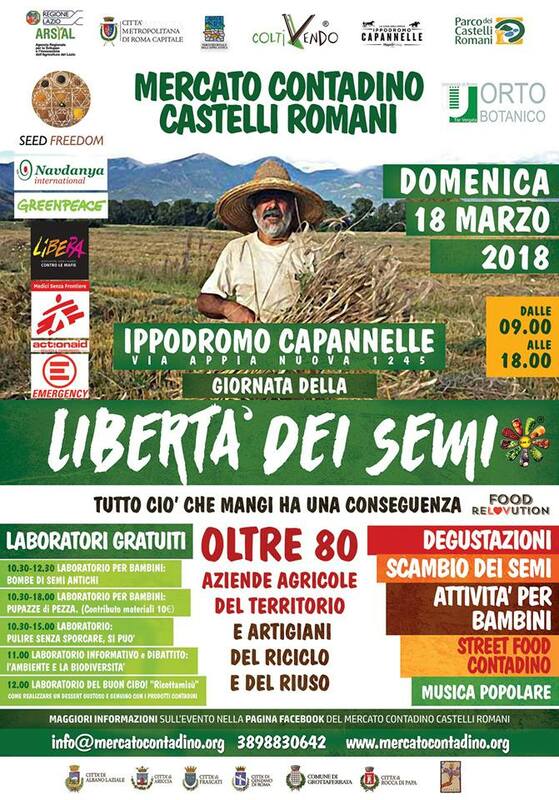 On March 18, Navdanya International took part in a Seed-Freedom Day at the Farmer’s Market, a concrete and positive example of creation of local and ecological agricultural and food networks. The event, coordinated by Mercato Contadino Castelli Romani in collaboration with the Botanical Garden of the University of Tor Vergata, took place at Capannelle Racecourse in Rome. Navdanya International launched the Global Seed Freedom Campaign in 2012. Over the years the Campaign has focused on the importance of seeds as a “common good” and on safeguarding food sovereignty in a political and social context in which control over seeds and nutrition has become the strategic objective of a few multinationals. . Navdanya has therefore promoted common and shared strategies for the defense of the right of citizens and farmers to save, exchange and breed their seeds freely. During the event, Navdanya International presented its campaigns for Poison Free Food and Farming, against the Corporate Takeover of our Food and Health and for Economic Democracy.